Full disclosure: A review copy of Kung-Fu Zoo was provided by Trusty Lamp Games. Still running a giveaway this week! Check it out if you want to win ICECOOL2, ICECOOL’s standalone expansion! For more flicking games, keep reading! Alright, more Gen Con games — this one’s a neat one; Kung-Fu Zoo, a dexterity game from Trusty Lamp Games. As you might guess, I’m definitely a fan of animal-based flicking games, but how does it measure up against my personal favorite? Read more and let’s find out. In Kung-Fu Zoo, well, you’ve stayed a bit later than you should and you’ve found out a secret. After dark, when the last employee has finally left the park, the animals sneak out and participate in no-holds-barred cage fights! Gather your team and leverage their special skills if you want to come out on top of this match. Will you be able to win the bout? Or will you get slammed by your opponents? On your turn, take your die and place it on the midpoint of one of the rails. Flick the die such that it tumbles into the play area. It needs to flip over, otherwise you have to put it feet-side up. The second player must bounce off a wall before hitting the first player’s die on their first turn. That’s just the rules. That’s the core of the game. In Cage Match, you’re doing that in service of dunking your opponents back into their cages. 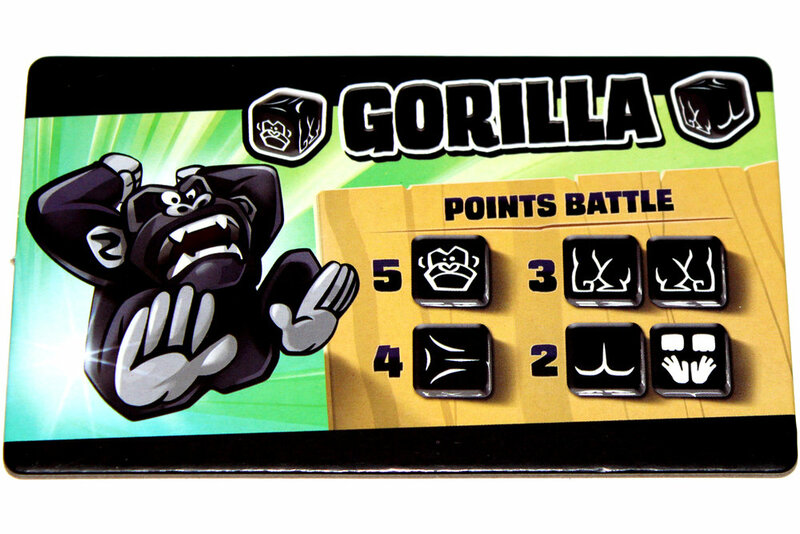 This means you only stop when your opponents’ dice are in the cage holes or all feet-up (meaning they’re stunned). However, since you only stop when you win, you gotta send your animals back into the ring! Once you’ve gotten your animals in there, you can pull any non-stunned animal out and place them on the midpoint of a rail and flick them again on your turn. If they’re face-up (you can see their face), you can put them anywhere on a rail instead. If you manage to knock an opponent’s die into a cage, you may take another shot for free. If you knock their die out of bounds, they may replace it, face-up, anywhere in the arena. Naturally, penalties take precedence, so if you knock both your die and your opponent’s die into cages, you don’t get an extra turn. In this mode, each animal also has a special ability that they can use once per round; check the cards for the exact abilities and timeframes. If you’d like, you can play with an optional variant where instead of leaving stunned animals, you may flick them with your pinky or your non-dominant hand. If you knock out all your opponents’ animals, you win the round! First player to win three rounds wins the game! If you’re playing 3 – 4 players, the rules are the same (though you must use that optional variant that I mentioned) but you may only have two dice in the arena at a time. You add the other two dice once the first two dice are caged, and you must add them on two consecutive turns. In Points Match, on the other hand, you’re trying to score as many points as possible by flicking your dice in skillfully so that they land with certain sides up (as indicated on your score card). The thing is, your opponents’ dice will also come into play and may knock your dice around. 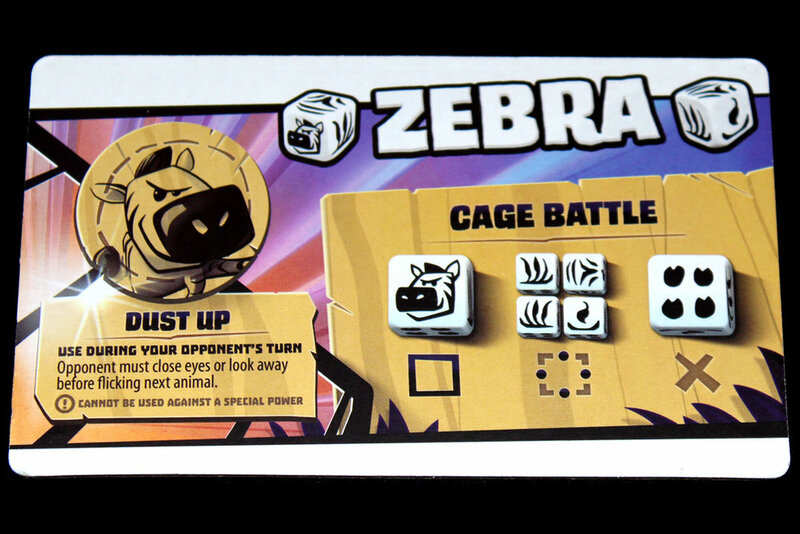 You’ll score more points for face-up dice, and you still get the extra shot if you cage your opponents’ dice, but keep in mind that you might not want to take the shot if you only have high-value animals currently in the arena. Play continues in a round until all animals have been hit in. Once that happens, score them; the player with the higher score earns the difference between the two scores as points. Then, play another round. When one player finishes a round with at least 21 points, the player with the most points wins! You just score the points at the end of the round. You don’t have to worry about the difference. Games last 5 rounds. The player with the most points at the end of five rounds is the winner. Mostly covered above, but I think the game is much more fun at 3 / 4 than at two, for me. I like the high-chaos of a bunch of players’ dice flying around and I’m honestly not good enough at the game to consistently knock in my opponents’ dice. I’d much rather play FlickFleet for a two-player dexterity strategy game than Kung-Fu Zoo, which is more of a 4-player party game, in my opinion. My personal preference for KFZ is probably on the higher end of the player count spectrum. Hit face-up dice. You want to flip your opponents’ dice over to the stunned side, sure, but you definitely don’t want to leave them face-up! That gives them so many more options. Just try to tip those over when you can. Use those abilities. I mean, you have them for a reason; you might as well use them. The reactive / defensive ones are particularly helpful if you can stop opponents knocking in your dice or you can make them target other players’ dice, instead. When removing dice to hit again from the board, remove dice near holes. That only may be helpful because you might just hit that die into the same or a different hole, but, I mean, it’s a suggestion. I mean, go after the players you can knock into cages. In either mode you want them off the board, so you should do your best to hit them into the corners with precision. Just, you know, make sure that you don’t end up missing them / hitting them too hard and your dice end up in those fancy corner cages, as well; that would be bad. If you don’t have a useful shot, just kinda try to stay away from the corners. Might as well not make it an easy setup for your opponents, if you can avoid that. Just have fun. Again, it’s a silly free-for-all dexterity game; there’s only so strategic you can be. Cute theme. Who isn’t at least slightly amused by the after-dark cage fights of zoo animals? The dice are pretty nice. 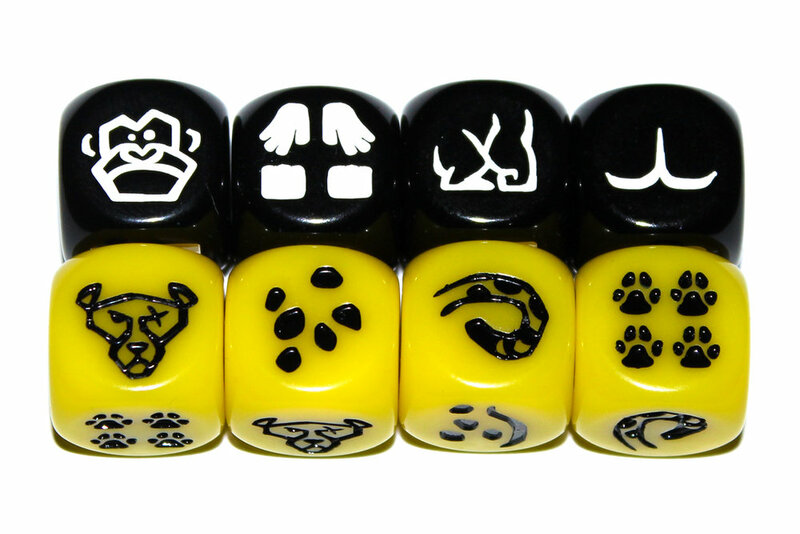 I’m always a fan of custom engraved dice; the fact that each type is unique (rather than being a generic “animal” of a color) is also a very nice touch. It makes each team seem very authentic and personal, which increases my investment in the game, at least. Seems very expandable. I’ve seen some pictures at least that suggest that four animal types is a low ball and that hopefully more will arrive at some point in the future? That would be pretty cool and definitely add some replay value, especially at four players. Pretty easy to play. You just kinda flick dice into the center of the board. There’s not a whole lot else going on. Plays very quickly. Maybe too quickly, at times; I’d almost want to play a game with 8 dice or something to actually have a lengthier and more hectic round with more collisions and strikes. Pretty much zero setup. That’s always nice; you basically open it, give each player a baggie, and then it’s time to play the game. Really helps get the game to the table quickly. Similarly, there aren’t that many rules to explain, so actually getting to the game is pretty painless. The abilities are nice, but only getting to use them once per round is kind of a bummer. I understand that that’s because they’re rather powerful, but I’d love to see a mode where you’ve just got all sorts of wild combinations and abilities happening all the time. It’s the kind of frenzied play that I really look for in a dexterity game. The box is a very particular shape. I appreciate the consideration in not making it much larger for no reason, but it’s hard to find a place on the shelf for weird-sized boxes like that. It would almost be nice to have some sort of “novice mode” or bumpers for newer / bad players. Half the fun is slamming the dice around in the ring, so naturally the times in which a player’s first four turns are watching all four of their dice go directly into the hole are … dissatisfying, at best. It would be kind of nice if there were some fix for that, though I’m not sure exactly what that would look like, honestly. I find Points Mode underwhelming. I’m here for the combat, personally, but your mileage may vary. Also a bit underwhelming at two. You need the higher-chaos play with more players, in my opinion. Overall, Kung-Fu Zoo is pretty solid! I mentioned I’m a bit underwhelmed by Points Mode, yeah, and that I wish the rounds took a bit longer, but honestly it’s a very quick play, even at three or four players, which is my preference. That said, I do have a soft spot for almost all dexterity games, especially ones with fun art and fun themes, which this one has. I also think it has a pretty simple system, which means you can probably build off of it to add on new and exciting additional modes and games, which I imagine will probably come later. Always something to look forward to. That said, Ice Cool will probably remain my animal-flicking game of choice, for now. 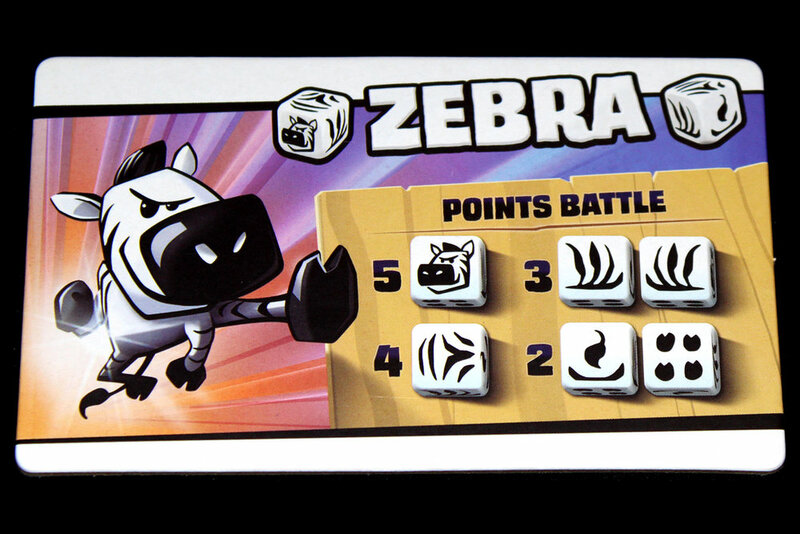 If you’d like a bit more options as to which animal you can flick or dice flicking is more your speed, however, I’ve had fun with Kung-Fu Zoo; maybe you will as well!